Harper’s Weekly. New York: Harper’s Magazine Company. February 25, 1865. Asa Packer founded Lehigh University in 1865. 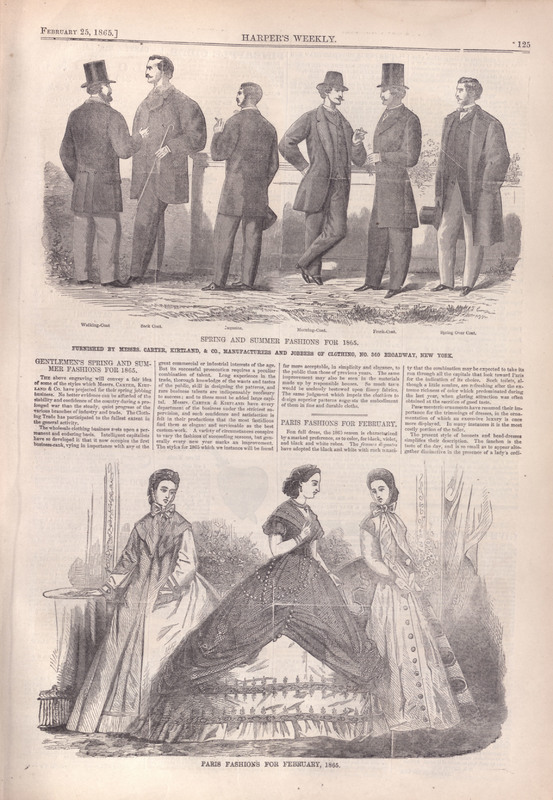 The illustrations of both men’s and women’s clothing appearing in this magazine reflect the possible clothing worn by Asa Packer and his family. By 1845 the sewing machine had gained popularity around the country and the world. The sewing machine accelerated production of everything which required stitching – most especially clothing. Ready-made clothing replaced and outnumbered the idea of owning only a few items of clothing. Increased efficiency meant lower production costs as well as a rise in fashion as noted in the Harper’s Weekly. Few inventions have changed everyday life as radically as the sewing machine. Although many attempts were made in creating a useful sewing machine, it was Elias Howe, Jr. (1819-1867) who made the innovations to the many machine designs available from the early 1800s. He received a patent for his design of a machine that could sew straight, as well as curved, seams. His patent expired in 1867 and the design was continued by Isaac Singer who made the sewing machine a household item.